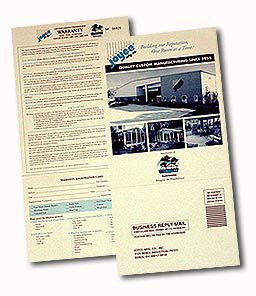 LR 2000 – Joyce Mfg. Co. 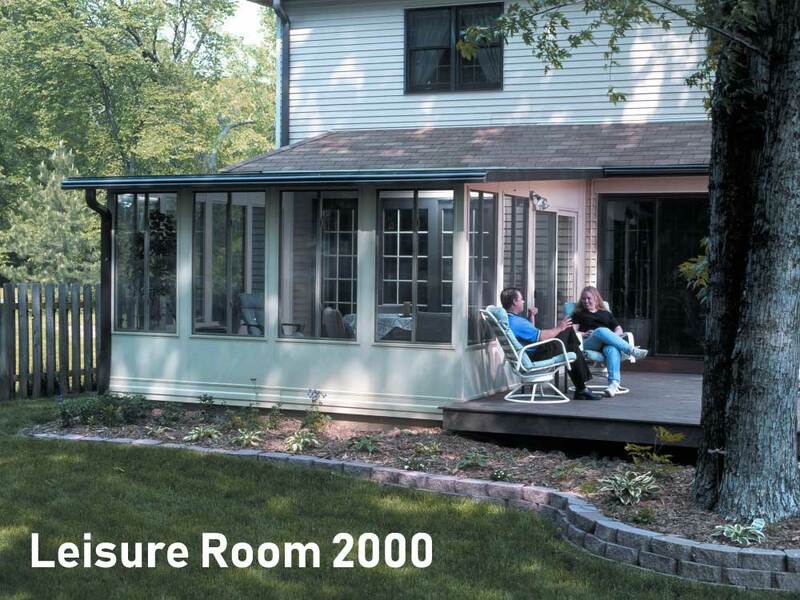 The Leisure Room 2000 is our seasonal room and since the room is also all vinyl with welded sliding windows, we like to call it the “extended” seasonal room. The LR2000 is available in studio styles only and white only. Like our other vinyl models, the room shows no visible fasteners, concealed electric raceways, and the clean finished look. All glass in the LR200 is single tempered. This room is priced right so anyone can enjoy the benefits of living outdoors/indoors. 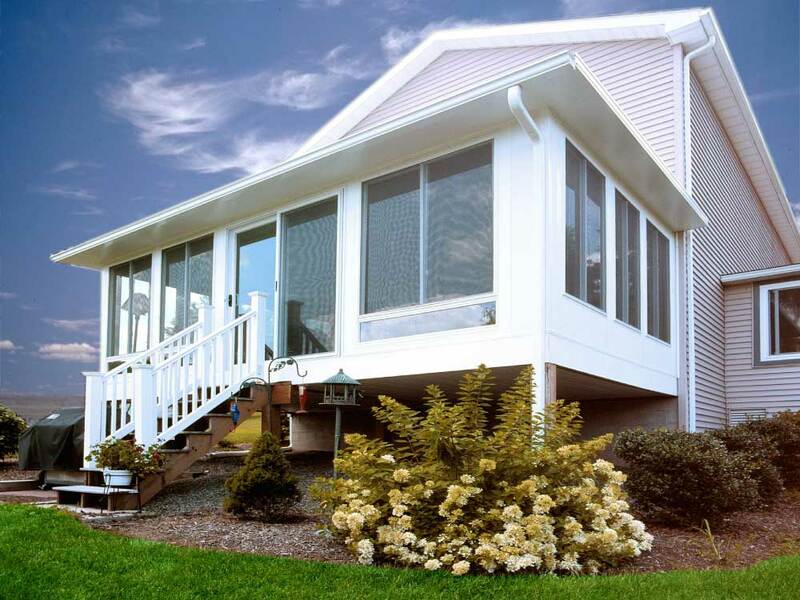 VINYL IS NOW THE MATERIAL OF CHOICE FOR MANY OTHER BUILDING PRODUCTS, SUCH AS SIDING, WINDOWS, AND PVC PIPE. 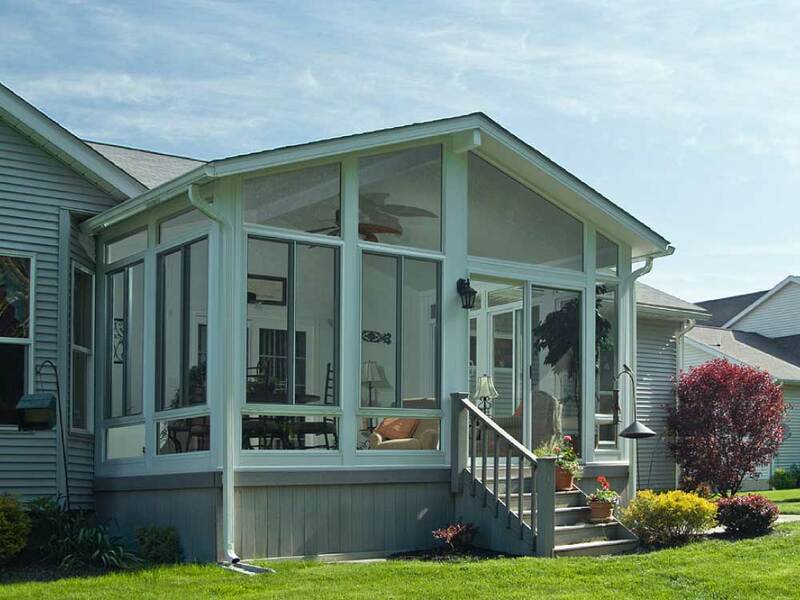 MOST IMPORTANT, A VINYL SUNROOM LOOKS LIKE IT WAS MEANT TO BE PART OF YOUR HOME, NOT AN AFTERTHOUGHT. 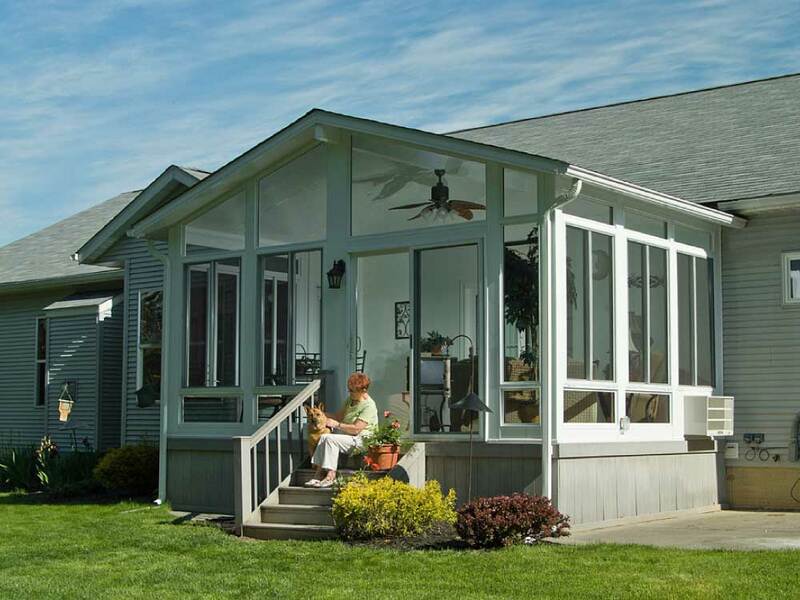 Oasis® vinyl sunrooms feature solid virgin vinyl (PVC) as the main visible component. Solid virgin vinyl has many advantages over aluminum. Vinyl is clear color throughout, a non-conductor of electricity that will not rot, chip or corrode. Oasis® vinyl glass rooms incorporate fusion welded vinyl windows (sash and mainframe) in the unique vinyl wall system. Aluminum windows are typically fastened together, while Oasis® vinyl windows utilize welded corners eliminating the opportunity for the elements to enter inside the patio room. Vinyl, naturally an insulator, allows homeowners to extend their patio room’s season because vinyl has much less heat loss than other building materials. All Oasis Leisure Room series include tempered glass only. Tempered glass is virtually unbreakable and can withstand the hit of a baseball or other objects. If tempered glass ever did break, it becomes harmless shards that are not sharp and can easily be cleaned up. All of our rooms are available in either Cardinal LoE3 366 insulated tempered glass or single tempered glass. The LR2000 is only available in single glass. 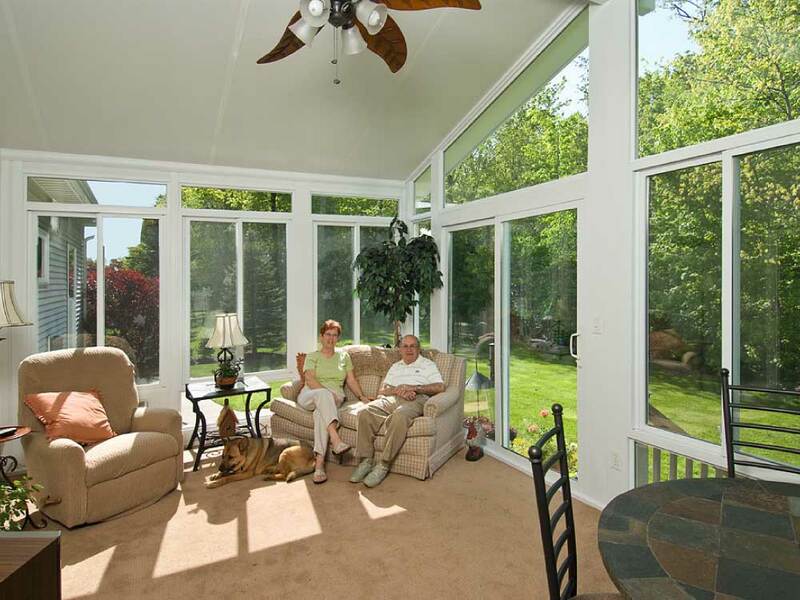 LoĒ³ (low E cubed) glass tempered , manufactured by Cardinal® IG, is a superior insulated glass by reducing the loss of radiant heat in the winter (the heat from your furnace) and reducing heat and damaging ultraviolet rays entering into your Oasis® sunroom during the summer. LoĒ³ is actually three layers of silver in a multilayered film which includes other chemicals such as titanium dioxide and nickel. 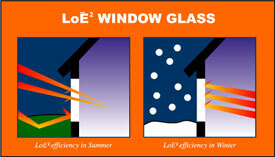 LoĒ³ is used in insulated glass which is filled with argon gas for more energy efficiency. In warm seasons, LoĒ³ keeps much of the heat out of the patio enclosure and reduces dramatically the fading damage from ultraviolet rays (up to 95%). In cool or cold seasons, LoĒ³ keeps the heat in and the cold outside where it belongs. LoĒ³ uses an XL spacer system. Warm edge characteristics of XL Edge reduce the frequency and amount of condensation during the most extreme temperature conditions. LoĒ³ is available on all patio rooms manufactured by Joyce™. For more information on LoĒ³ click here for Cardinal® IG web site. Single clear is 1/8” clear tempered glass. TCA-Guard® is a natural applied mineral substance that is added to ALL of our foam products to protect and prevent wood boring insects (i.e. 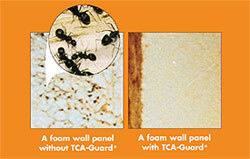 carpenter ants and termites) from damaging your Oasis® sunroom. TCA-Guard® is safe, non-toxic, non-corrosive and standard in ALL Oasis® sunrooms. 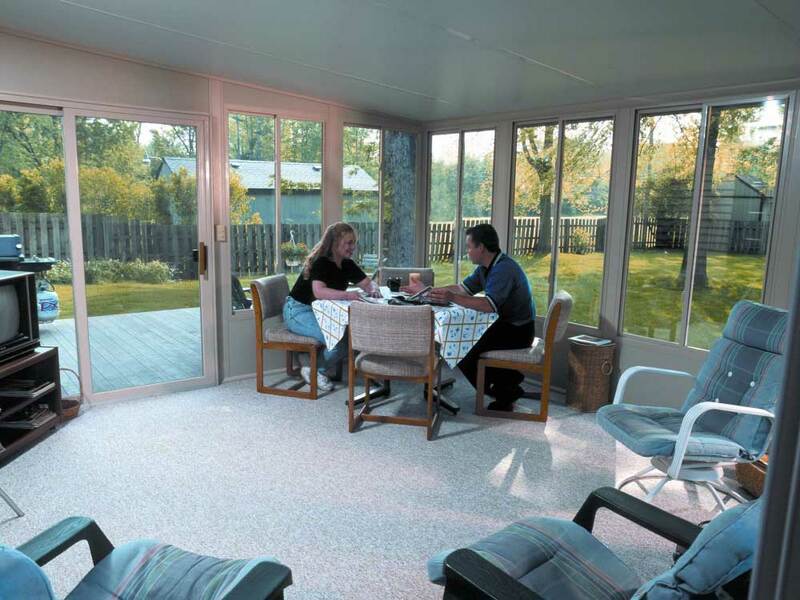 Insul-deck™ panels are a strong, easy to assemble, economical, insulated patio enclosure floor. The insulated deck system has exceptional R-values using structural panels composed of EPS foam with TCA-Guard® protection sandwiched between OSB panels. 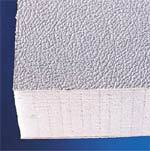 The panels are available in many lengths in 6” or 4” depth and 2’ or 4’ wide panels. The underside can be protected with painted aluminum skin for moisture/vapor resistance. 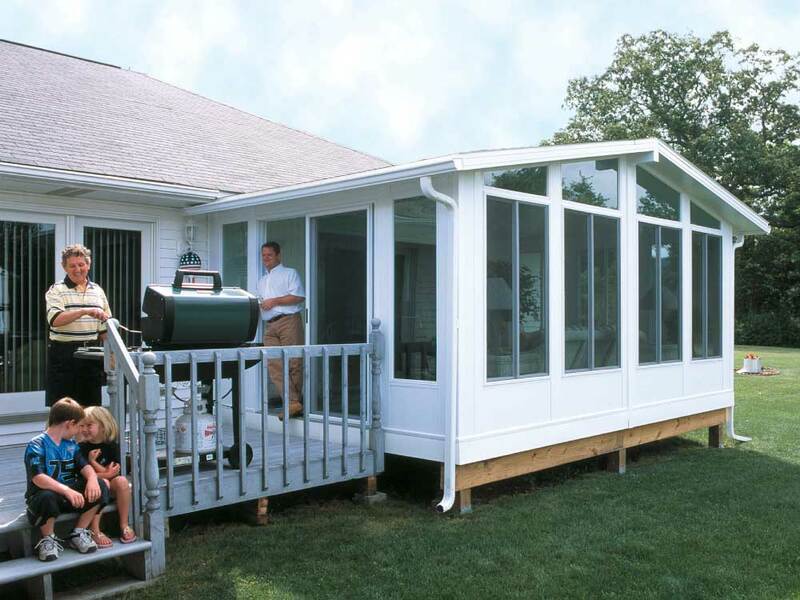 Oasis® vinyl sunrooms also have the option of an electrical raceway system that is an approved product by UL. This product is UL Classified by Underwriters Laboratories Inc. (UL) to NEC, 2002 edition.UL is not affiliated with Joyce Manufacturing Co. and does not endorse the web site. Korad® is a very durable polymer covering the vinyl wall panels which provide the benefits of scratch free, impact resistant and virtually non-fading protection. KORAD® insulated wall system with fade and TCA-Gaurd® protection. Maintenance free skylights in matching vinyl are available in fixed or operating styles. Both styles are standard tempered LoĒ² glass. Joyce™ manufactures a strong, yet elegant vinyl swing door standard with bright brass lockset and deadbolt featuring tempered LoĒ³ glass. Joyce Mfg. Co. has been in business since 1955. We live by our tag line of “Building Our Reputation, One Room at a Time®”. This is important as a warranty is only as good as the company behind it. All Leisure Rooms® carry a lifetime limited transferable warranty on everything we manufacture. Vinyl, the main component, is warranted not to crack, corrode, rot, rust, peel or blister for as long as you own your home. Our glass (all tempered) is warranted not to break as long as you own your home. All components and insulated glass seals are warranted for a lifetime and transferable. See actual warranty for details. The warranty is also transferable. See the actual warranty for details.